We are one of the leading manufacturers, exporter and suppliers of Vesicular Arbuscular Mycorrhizal Fungi. Our experts are offering high grade fertilizers to meet international industry standards. These are well known for their strength and effectiveness. Our range of fertilizers are available at market leading prices. 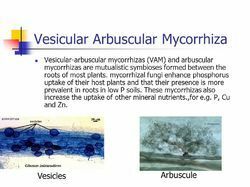 VAM / AM / Mycorrhiza VAM is Vesicular Arbuscular Mycorrhizal Fungs and also known as Arbuscular Mycorrhzial Fungus. Gmax VAM is produced in vermiculite based sterile media with high number of infective propagules per gram. Product Details: Technical: Gmax VAM is a bio inoculant based on sterile vermiculite containing high density VAM propagules per gram. Gmax VAM is produced from the mother culture of TNAU. The primary mycorrhizal fungus is Glomus fasciculatum. Formulation The product is available as sterile vermiculite based formulation (Powder). Gmax VAM inoculum can be used for all crops. For perennial crops and long duration crops, VAM inoculation gives excellent resuts. Nursery application:In nursery bags of seedlings, use about 25 g of Gmax VAM inoculum. This can be mixed with red soil, sand and compost and filled in the bags. Pit application: Mix about 50 g of Gmax VAM with 500 grams of compost and fill in the pits before planting. After planting, mix about 50 g of Gmax VAM with 500 grams of compost and apply in basins around the plants/Trees. For perennial trees, three applications are required in three consecutive years. Field application: For field crops like Tomato, Brinjal, Onion, etc., mix about 20 kgs of Gmax VAM inoculum with 100 kgs of compost and broadcast in the field. Gmax VAM is recommended for all crops and for perennial crops (all tree corps), VAM application is essential. Gmax VAM can be used along with Gmax Nitromax, Gmax Phosphomax, Gmax Tricon and Gmax Fyton to provide nitrogen, phosphatic nutrition and to provide plant protection from diseases along with plant growth promotion. Looking for Vesicular Arbuscular Mycorrhizal Fungi ?